Whittemore-Prescott senior Ridge Schutte pins Colon's Brenden Shelton for third place state finish. 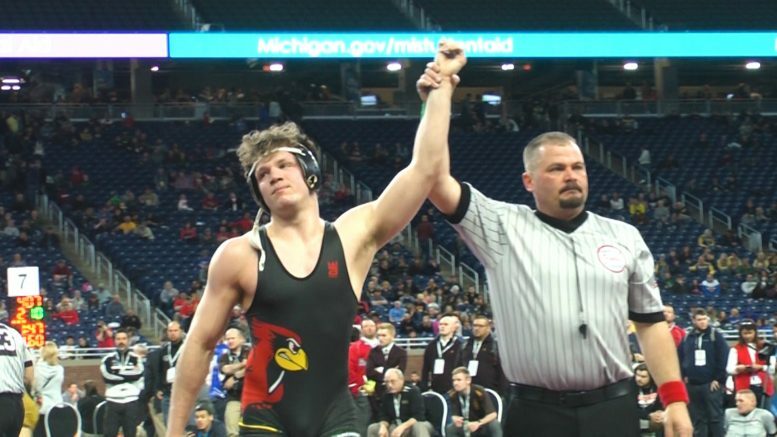 Detroit, Mich. — Five teams and 15 wrestlers from northeast Michigan attended the MHSAA State Championships at Ford Field. Six athletes advanced to Saturday’s final rounds and finished in the top eight in their weight class. Whittemore-Prescott senior Ridge Schutte looked to perform better than his third place finish as a junior. Schutte pinned his first two opponents in the 189 weight class, but lost in the semifinal against Beaverton’s Kyle Cassiday in a 4-3 decision. Schutte dominated his next two opponents. The senior defeated New Lothrop’s Camden Orr in a 10-4 decision and pinned Colon’s Brenden Shelton in 2:44 resulting in a third place finish for the second year in a row. An outstanding performance by the senior. Ridge Schutte in third place match at state against Colon’s Brenden Shelton. Oscoda advanced three wrestlers to the top eight freshman Anthony Ward and juniors Andy Dault and Christian Ward. 130 lb. Anthony Ward, ranked ninth, became the 2nd freshman to earned All-State status for the Owls by beating Onaway’s Teddy Peters, whom he had lost to twice this year. Ward finished eighth and also became the first freshman in Oscoda wrestling history to earn 50 wins. 130 lb. Andy Dault, ranked sixth, upset Jared Checkly ranked fourth from Decatur in the 2nd round of consolation to earn a place in the 5th place match. Dault lost to Jacob Cassiday from Beaverton in sudden victory to finish sixth. Oscoda junior Andy Dault upset fourth ranked Decatur wrestler Jared Checkley. Christian Ward, ranked 12th, lost his first match to Michael Minne ranked seventh from Martin in the 215 lb. class. Then Ward battled back with three upset wins including a pin over Gage Stimer, ranked eleventh from Napoleon, fifth ranked Anthony Filkins from Sandusky in sudden victory and Brian Yeakey ranked sixth from Carson City-Crystal by a 5-4 decision. Oscoda’s Christian Ward throws down Carson City-Crystal’s Brian Yeakey. Onaway and Rogers City advanced one wrestler each to day two. Onaway junior Matthew Grant finished sixth in the 135 weight class. He won his first round bout, but lost his quarterfinal. Grant made up for it by winning Consolation rounds two and three. Hurons’ Isaac Hein finished in eighth for the 140 weight class. The sophomore won his first two consolation matches.